More highlights done on these guys. The main highlights here are to the gold on the armor and the weapons. I also did some highlights to other details on these models, such as horns and skin. All that’s really left is to do the grey highlights on the black armor plates and do the blue highlights on the power coils of the plasma guns. Everything else is pretty much done, I believe, sans the bases and water transfers. I had more trouble than usual doing the gem work for the eye pieces on these models. It’s probably that I’m a little out of practice with the red scheme. That one seems harder for me that others like green or blue. I have absolutely no coherent explanation for this; it’s just what I’ve observed about my painting over the years. With the trims, I mentioned before I was using Chestnut Ink to give the Shining Gold trim a reddish luster. That worked. But I also took it a step further this time and added Mithril Silver highlights to the gold trim as well. It might be hard to see in the crummy picture above. Once I have these guys really complete, I’ll spend some time really getting some decent pictures from different angles and try to single out models. Anyway, I’m happy to have these guys close to the finish line. It’ll be funny to look at these guys alongside some of my older Black Legion models. 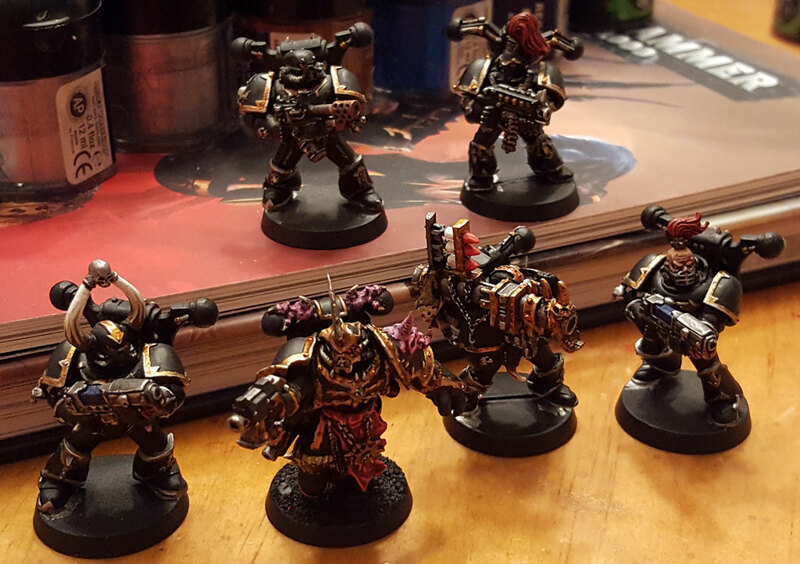 As Black Legion was my first army, you can clearly see some evolution in my style over time. I’ll have to post pics about that, too.